Is there any way to get the Variax electronics installed in other guitars? I am interested in something better than Korean versions of JTV-69 at $1,000. But the US guitars at $5,600 seems a little to far price wise. I would love to get something like a Music Man Cutlas ($1,500) and have the Variax electronics installed. If the was a production product I would hope it would sell for $2,300. You can't buy the electronics separately. You need to buy a Variax, strip out the electronics, and transplant them into a different (properly internally routed) guitar. Some people have done this themselves and some have paid experienced guitar techs to do it. Obviously no Line 6 warranty applies. Technically you can buy the key electronic parts separately, but I can't be sure that you can get everything or that buying them wouldn't cost more than a donor guitar! But you would really need an example guitar to work from because there are no instructions with any of those parts or guidelines for the extensive routing needed. ToasterDude has done a few projects - all of which seem to involve the colour purple - but they are certainly impressive looking. Rewolf48- There are parts listed but the main board is not one of them unless I completely missed it. But to the OP there are quite a few people who have done it. That's correct. The main board is only available by purchasing a guitar, or for ordering by an authorized service center in the context of repairing a guitar. I suppose one could try ordering the main board (and other unavailable parts if any) through a service center but I expect they would require a trade-in main board that needs replacing. Line 6 keeps pretty tight control over the Variax technology. ... the hardware is the same, but the programming for each of the six versions is different. If you were to choose the wrong one for your non Line 6 guitar, you would have a problem. that I know can do it without messing it up. And yes,... silverhaed is correct, if it gets messed up, there is no Line 6 warranty attached. It's at your own risk. It is unsupported modifications. know what you are doing, or know someone who knows Line 6 Variax enough to do this. I can tell you that Variax electronics will have a different tone color and sound in a different body. What are the "six versions" ? Go to a guitar show. There are numerous talented builders out there who would be able to accomplish this Herculean task in their sleep. I'm not claiming to be one of them, but they exist. There might actually be more if you consider the variations and the Shuriken. Four JTV's (59, 69, 89, 89F), the Standard and the Shuriken. configuration and either the Alt Tune select won't light up on the one you select, or half the Model won't show up. and custom load each Model to where you want it. True. Well, the four that I refer to are four that I know of. and build stuff in my sleep, a kind of practice run before the main event. I still don't suggest it should be attempted. The -4 board is for the 89F only,... there is an error there at that link. wrong guitar for board you have. 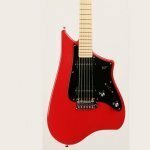 Can I send a Guitar to Line 6 to get a Variax system installed? I want better that the Korean version but do not want the 5K plus James Tyler. If I have a PRS that I loved, could I et Line 6 or a Line 6 Approved work shop to install it correctly? Modifications are not Line 6 supported. And we don't have a custom shop to do that. It will sound different, tone color will sound different in a PRS body. Thank you for the response. So the LP or Start modeling is differently firmware for a JTV-59 and a JTV-69 because the woods and neck joint and scale length, and bridge all create a different starting point? though to a lesser extent. Two lefties, one using a Flying-V body, the other using an SG copy body,... each had slight differences in tone color. If you play a lot of JTV's, you will notice a differences, if you don't, then you would not know any differences unless you A/B them. I would love to get the guts of my 89F transplanted into an alder body superstrat. I love my 69, but would love to have the graphtech Floyd. Who are some of the builders up to the task? I can't walk you through it, but I can warn you of what not to do. Since I'm about to embark on a transplant project, would you please share with me your warnings of what not to do? :) I understand that the models won't sound like L6 intended them. Don't hold your breath....if they started handing out do's and dont's to everybody who asks, that would be giving tacit approval to the modification of their products, which they don't (and likely never will) support. I explained this on Idea Scale earlier as well. Tone color will be different in different body types. You can't plug the processor board into any old hardware. the afore mention items in my prior posts up to this point. OK, thanks for that. I'll look up your prior posts on this. then that could be a problem,... especially with the Alt Tune. Different set of Alt Tunes. 89/89F selections won't match up with the selector labels on a 69.
intend to chop the 69 body to fit the 89F bridge (some have thought about that and backed-off). It will still sound and feel like a 69 Trem bridge,.... up to a point. Modeling software can only do so much, going beyond that creates problems. intend to chop the 69 body to fit the 89F bridge (some thought about that and backed-off). Did you do the mods to Jennifer Batten's 69? Just curious, I've always been amazed by her playing and only just learned that she uses a JTV. The mod's,... no. But I've serviced her 69 and did some follow-up tweaks to it. Very nice guitar. great work. Did some follow-up tweaks to the electronics in that one too. I considered this but after further investigation decided against it. After a good set-up I got used to the feel of the guitar and decided what I really didn't like about it was the look. I replaced the neck and middle pickups with SD stacks, created a custom pickguard template to have a new guard made, reshaped the headstock and got a new paint job, So far I am very happy with it. Nice reworking. More details please: what neck - and why did you then reshape the headstock of the new neck? It is the original neck. I see you have fitted string trees - do they help with the behind the nut ringing? I have toyed with the idea of fitting a bar on mine just behind the nut so that all strings go over at the same angle. Has anybody else tried that? But I am a chicken when it comes doing a permanent changes to an expensive instrument - but I suppose as it is a 2011 model I could be a bit braver. I was getting some warbly sounds from the piezos and my tech recommended them. Even with the staggered height tuners he said the angle was wrong at the nut. Made a significant improvement. Warbling is a result of pick-up height distance between the pick-ups and the strings. The pick-up height needs adjusting. might affect battery drain rate when using the battery). to the tuning posts. Not an end all, be all solution, but it helps in certain circumstances. I am wanting to do something similar. I have a JTV59, the LP type and want to put the electronics into an Epiphone LP since the Variax guitar weighs like 15 pounds. I don't want to make any mods to the Variax stuff or change pickups. I literally wanna take out the Variax guts from the JTV and place them into an Epiphone LP. I realize I will have to route the back and all that, but I really don't see how I should have the problems all the naysayers on here are talking about. Granted the wood is different than the lead-impregnated wood Line 6 is using, so I expect there could be some change in tone, but my back will appreciate it so much that I'm not worried about it. Anybody got comments? Thanks in advance. If you've undertaken major surgery like that before, and are confident that you know what you're doing, then have at it.... but you're not changing a tire. There will be numerous opportunities along the way for you to butcher a perfectly functional instrument. I work with 2qty 59’s and they’re heavy but still lighter than a late 70’s Led Paul black beauty. 15lbs? Is that verified on a scale? I do believe JTV59’s chambered (not sure - someone knows). Gotta remember the beefy bridge, electronics and battery pack weigh something more than perhaps the wood removed to house all the electronics? Pretty sure the neck is Maple as my finish wears off reveals bright wood under there. Out of warranty thing to do of course but if you’re game, give it a go! Photos of the carnage and results please! I have a Variax Standard transplant project in the works. I have the cavities designed, but Fusion360-to-SVG file conversion issues are stopping me from loading them into my CNC at the moment. I'll let you know if I ever get to the finish line successfully. I am wanting to do something similar. . . . I'll just leave you with this one though. Good luck. I'd be braver about swapping kidneys with my dog. What *I* would like to see is the availability of a Variax 700 Acoustic module. My guitars currently have piezos going out one output, and magnetics going out the other. I am quite pleased with my magnetics; those pickups give me exactly what I'm after. And my piezo output sounds good (Graphtech Ghost). But I would LOVE to have the Variax Acoustic models available - various 6-strings, 12-strings, sitar (! ), etc. - to give me the variety of acoustic sounds I'd like to have. There's nothing like that on the market at present, and that would be so useful.